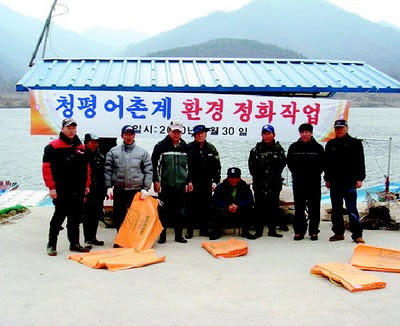 The Banner reads"ChungPyung Fishing Cooperative Environmental Clean-up Operation"
Here is an excerpt from "Evaluation of the ocean governance system in Korea." still remain in Korean society." Perhaps surprisingly this was written by one Cho Dong-Oh, a native Korean at the Korean Maritime Institute in 2005. In addition to being simply logically unclear, i.e. in what sense could the "practice of Confucianism" conceivably "reach familiarity with the oceans," Mr. Cho does not elaborate at all on how the Confucian culture of Korean citizens has stifled constituency building efforts. Furthermore knowledgeable constituencies for coastal governance have actually always existed in Korea. Eochongyes (어촌계), best described as local fisher cooperatives, are still existent and have long been the traditional means by which Korean's have managed their coastal and marine common-pool resources. So it is likely that when Mr. Cho speaks of weak constituencies he actually means that citizens have historically have not been informed about, or perhaps not supportive of, the plans and activities of the national government in coastal and marine environments. So in a way, though I doubt as he intended, Mr. Cho is correct in stating that Confucian values are to blame for weak constituencies. But the cause of this ignorance and lack of support is not the Confucian values of the citizenry, but those of the authoritarian leadership in Seoul. Are authorities in Seoul going to buy what you are saying? Or, are they even going to know what you are saying? How far does this blog reach? The authorities in Seoul would probably have mixed reaction. Though, as far as I am aware, my blog has no "reach" and therefore it is highly unlikely that they are aware of what I am saying. On reflection I think the post comes off a little too negative. I usually write these kind of posts simply as a way to reflect on, and record, my thoughts as I do my research. As such the opinions expressed in them are usually very preliminary and tentative.